In Arkansas, bare root roses are planted in February and March. Potted roses can be put into the ground at any time. Although raised beds are ideal for growing roses anywhere, Arkansas gardeners have great success growing them in the ground. Grow your roses in a location that receives at least six hours of sun per day and don't plant them too close together as they require air circulation both through and around them. Soak the roots of the bare-root tree in a bucket of water for three or four hours. Prepare the soil by using the garden fork to dig it up to a depth of 12 inches. Turn the soil and crush any large clods. Pour a four-inch layer of compost and a three-inch layer of sand onto the existing soil and mix it in to a depth of eight inches. Level the area with a rake and water it until the water just begins to puddle. Allow it to drain before planting. Dig a hole the same depth, but twice the width of the pot in which the rose is growing. Remove the rose tree from the pot and place it in the hole. If you are planting a bare-root rose, dig a hole 15 inches wide and 12 inches deep. On the bottom of the hole, create a mound of soil. Place the root ball on top of the mound and allow the roots to hang down over it. The roots should just touch the soil at the bottom of the hole. You made need to adjust the height of the mound to achieve this. Ensure that the bud union (the swollen portion of the trunk where the tree was grafted) will be buried one inch below the surface of the soil. Fill the hole halfway and then add water until the hole is full. When the water drains, finish filling it with soil. Tamp lightly around the base of the rose tree. Water the rose tree until the water puddles. When it drains, mound the soil two inches up the bottom of the trunk. Remove this soil when the tree becomes established. Give the rose two inches of water per week. According to the experts at the Central Arkansas Rose Society, how frequent you water will depend upon how warm and dry the weather becomes in your area of Arkansas. They suggest using a drip hose or soaker hose to apply the water slowly and deeply to the soil at the base of the plant. Mulching around the rose tree is a necessity in winter and summer in Arkansas. Growers with the Central Arkansas Rose Society suggest using several inches of pine bark or shredded oak leaves and replenishing the material as it wears down. In the winter, mound the mulch material six to eight inches up the trunk of the rose bush. Fertilize the rose for the first time in the spring, at the first sign of new growth. Apply a commercial formula, such as 13-13-13 according to the rate recommended on the package. Fertilize again every month and discontinue all feeding after Labor Day. Inspect the rose bush for insect infestations. 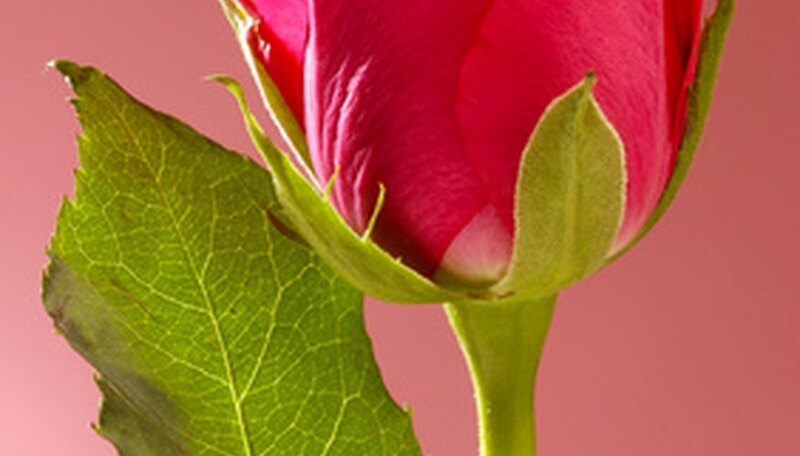 Arkansas roses are attractive to aphids, thrips and beetles. Although insecticides will get rid of the infestations, Arkansas gardeners should not apply them during periods when the temperature is over 90 degrees as the insecticide can burn the leaves. Consult your county cooperative extension agent for suggestions on which insecticide to use in your area of Arkansas. Check the rose periodically for signs of disease. Yellowing leaves, black spots and a white, foamy substance are all signs of fungal disease. To prevent these diseases, apply fungicide to the plants after the first leaves appear in the spring and reapply every 10 days during the growing season. Follow the application rates suggested on the fungicide packaging. Prune the rose bush to encourage new growth and get rid of dead branches. Mid-February is the best time to prune in Arkansas. Cut the entire bush to one-third its size and remove any dead branches. Always cut one-quarter inch above a leaflet that contains five leaves. Growers with the Central Arkansas Rose Society suggest sealing the cuts with white glue to prevent die-back.